'The Fast and the Furious' meets bikes as the Tyne Tunnel hosts the first Velocity cycle sprint race. Velocity will see competitors take on each other in several heats to compete for the 'Velocity' champion's trophy (pictured below). It's a knock-out style competition where the last one standing at the end of the heats will be crowned the winner. Hundreds of people will be able to pack into the Tyne Tunnel, which is being closed to traffic on the northbound side, to watch as the bikes fly past - lead out by two super cars. The southbound side will remain open to drivers and will accommodate both north and southbound traffic. 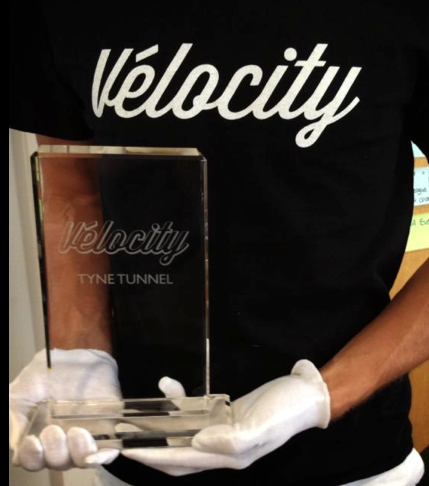 The Velocity event coincides with the annual Tyne Tunnel 2K wheelchair race, which this year will feature David 'Weirwolf' Weir CBE who bagged four golds and the 2012 Paralympic Games. The event takes place from 8pm with the TT2K first and the cycling getting underway from around 9pm. The final is expected to take place at midnight.